St. Joseph has been honored in New Orleans since its founding by the Catholic French in 1718, but the modern tradition of honoring St. Joseph with public altars across the city began in the 1880’s with the arrival of Sicilian immigrants to the city. St. Joseph’s career as the treasured saint who relieves hunger began in Sicily where he is credited with easing the famines that devastated the region and forced Sicilians to start their lives over in America. The tradition of the erecting altars to St. Joseph on his saint’s day, March 19, around New Orleans began with the Sicilians, but it quickly was adopted by the Catholic majority of the city’s population and remains a treasured celebration. Today there are over 50 public altars across the city that are open to the public in churches, homes, community centers, and other spaces. Some people will visit one or a few, while others make a pilgrimage across the city to as many altars as possible. Every altar is a collaborative creation of gifts of heirlooms and fresh offerings. Abundance is key, as St. Joseph’s Day is a day to celebrate the blessings in one’s life and the saint’s role as provider in times of scarcity. 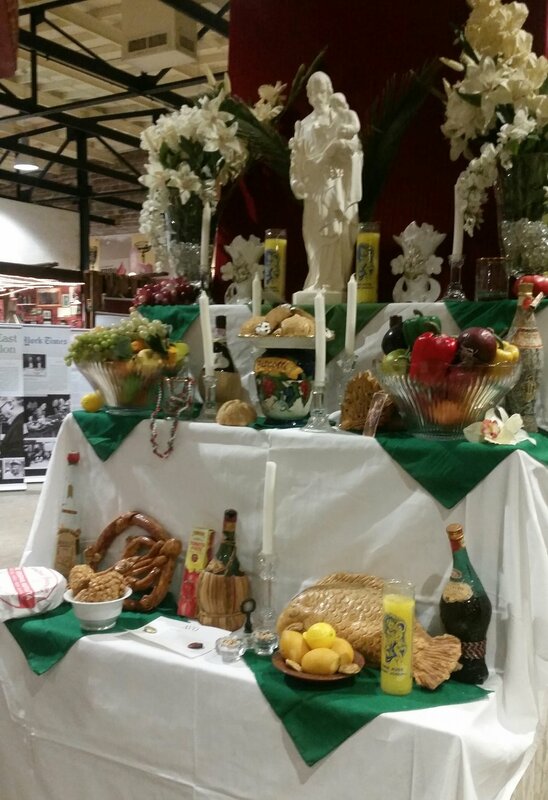 A St. Joseph altar is generally built in three levels to symbolize the Holy Trinity of Jesus, Joseph, and Mary. Usually, a statue or icon of St. Joseph will stand at the top of the structure that is cover with a base layer of white cloth. 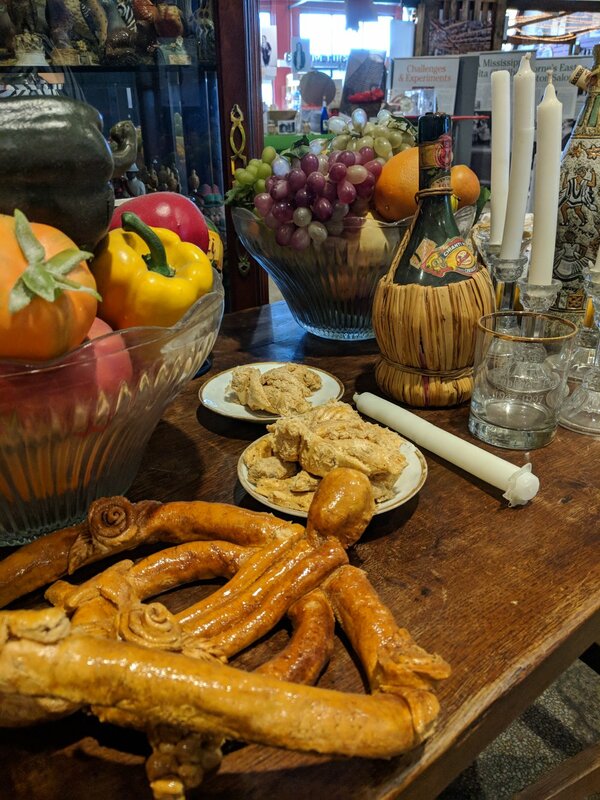 Common items to find on an altar are fresh flowers, saints medals, lemons, wine, candles, statutes and figures of the saint and his family, bread, pastries, jars of olives, palm branches, fruit, beads, fava beans, cookies, and more. Bread baked into various designs from carpenter tools, wreaths, flowers, shepherd hooks, fish, crosses, and almost any other design are popular gifts to the altar. Most edible contributions will be redistributed to celebrants and the hungry in keeping with the spirit of St. Joseph. Stop by the museum and check out our refreshed St. Joseph altar exhibit, which is on display all year long for visitors near and afar to learn about this unique tradition. If you are planning your trip between March 15, 2018 and March 31, 2018, bring a donation of canned or dried food (soup, pasta, beans, tuna, etc) for a 50% discount off regular museum admission. In the spirit of St. Joseph’s legacy, SoFAB is hosting a food drive through the end of March to ease the hunger still felt in our communities today. Join us this month in celebrating the history and traditions of the foods that have and will continue to bring us together for generations over a delicious meal.